The McCormick Tribune Ice Skating Rink in Millennium Park is open throughout the winter season (weather permitting). It opens on the same day as the Annual Chicago Christmas Tree Lighting Celebration, a 100+ year tradition which moved from Daley Plaza to Millennium Park. The rink will open to the public at noon and remain open through most of winter. 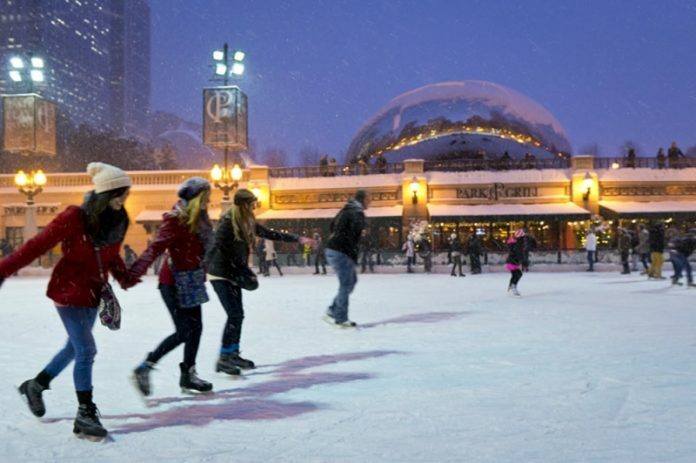 The ice skating rink is located directly in front of the Park Grill restaurant immediately east of Michigan Avenue. Bring your own skates or skate rental is $13 on Monday-Thursday and $15 on Friday-Sunday and holidays. Visit the website to view a complete schedule and skating hours. With its twinkling tree lights and stunning skyline backdrop, the iconic ice skating rink in Millennium Park is a must-stop each winter season. The rink is open to everyone of all ages and abilities. Be sure to check out the Skating Ribbon at Maggie Daley Park, just east of Millennium Park.